Is protectant good for my carpet? Does cleaning make carpet resoil faster? 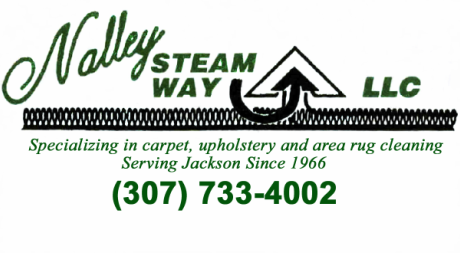 Nalley Steamway, LLC, located in Jackson WY, is the premier carpet, upholstery and area rug cleaning service for Teton County and the Jackson Hole area. We also clean in Bondurant and Star Valley. Jackson Hole has been our home since 1966, and our roots run deep within the community. When you use Nalley's you can rest assured that we have systems in place to give you quality workmanship as well as personal service right from your first contact with us. Our exact price is negotiated and discussed at the job site before the work is begun. There are no surprises after the fact. We accept credit cards as well as payments that can be made in order to fit within your monthly budget. We strive to help you save money by educating you on how to maintain a healthy home. Based on inspection of the carpet fibers and what’s down in the carpet at entry-ways, we may even take a look at your vacuum cleaner to make sure it’s meeting its full potential. 1. Test the carpet – type of fiber, make the plan of action for efficiency in setting up, cleaning and dry time. 2. Vacuum with a working vacuum – removes trash, removes soil in traffic areas, makes steam cleaning more effective. If a vacuum is not used prior to steam cleaning, there is more potential for cellulose browning to occur as the carpet dries. Vacuuming is a REQUIREMENT for all Nalley Steamway technicians. 3. Vacuum edges with truck-mounted hose – improves appearance, and non-vacuumed edges will darken over time. 5. Apply proper cleaning solutions and traffic lane pre-sprays prior to rinsing with the wand, being thorough and consistent, using the effective techniques that create good rinse-aid application and vacuum. 8. Protectant – Major carpet manufacturers feel that a protectant is important to have on the fibers. d. protected carpets release soil better for dry vacuuming and for the technician next cleaning. Protectant is removed by foot traffic, vacuuming and any harsh detergents that come in contact with your carpet between cleanings. It should be reapplied before the soil finds its way into the fiber. The carpet lasts longer, looks better and you are happier with your investment. 9. We perform a final Grooming for appearance and inspection from a distance. 10. Drying – We set windows for proper cross-ventilation, set temperature, leave dryer on site if necessary, schedule time for pickup. 11. (a bonus) A follow up call is made to ensure that you were “wow-ed” by our work. Any call backs are free of charge, and we will keep working on problem areas until everything has been tried. In the end, if you still don’t say “wow”, you don’t pay for it!! 12. (a double bonus) If you schedule again next year or six months, through our Year-In-Advance scheduling, you will receive a Free Accidental-Spill-Cleaning anytime during the year. HOME MEET US CARPET UPHOLSTERY AREA RUGS PROTECTANT F.A.Q. FREE ESTIMATE HELP!! Lizzy B. on Redmond: "Blown Away! Absolutely fantastic job. Landlord was super-thrilled and I got my whole deposit back. We thought we were going to have to replace the carpet. "Mercedes & John H. on Redmond: "We are very pleased. Thanks for the quick scheduling!" Stephan F. (Area Rug Cleaning): "Thanks for making this so easy. It was really convenient to be able to just drop the rugs off at your shop." Maggie & Jim H. on Teton Pines Dr.: "Professional looking technician. Thanks for the quick scheduling." Jovern B.: "You guys are WONDERFUL!!" Don Ryan: "I want to thank you in the office and the technician you sent for the amazing results of my carpet cleaning. You did a fantastic job and I wanted you to know!" Our cleaning plant is located south of town toward Hoback Jct. Go 1 mile past Wy D.O.T. and turn right onto KDC Lane. First entrance on your right, pull straight into the shop that says "Nalley" on the door.